Cute and unique owl salt and pepper shakers made of red clay. Partially glazed with the faces being unglazed. Holes for the salt and pepper are strategically placed in the eyes. Plastic stoppers intact. Perfect condition. Largest measures 2 1/2" tall. These are from the 1970's. Cute little shakers that were popular souvenirs at most gift shops in past years. These are from Grand Canyon in Arizona. Made of either redwood or cedar. Original metal stoppers. Perfect condition with no scratches. Measures 2 1/4" tall. 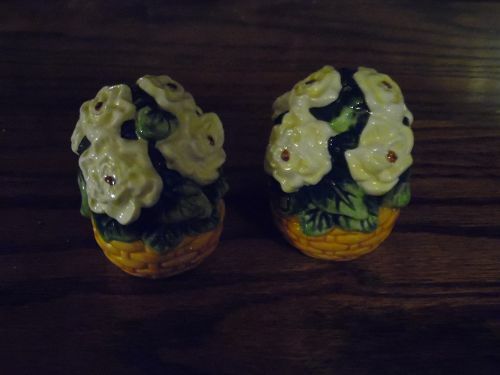 Adorable vintage shakers made by Lefton. Boy and girl mice, numbered 30404 on each one. One has the stopper intact, and is perfect. I just noticed the other has been repaired at one point. They display nicely though. Old and collectible, and so adorable. price reflects repair. 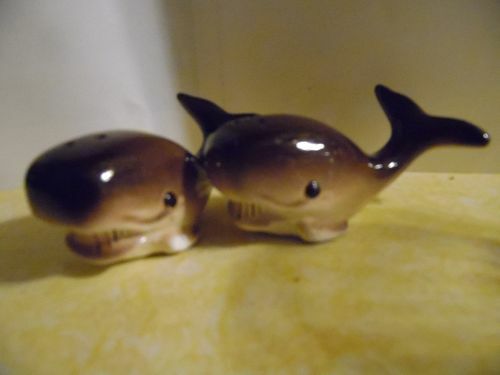 Adorable vintage ceramic salt and pepper shakers in the shape of two friendly looking brown whales. They appear to be smiling. Original old corks, but they are inside of each shaker. No chips or damages. 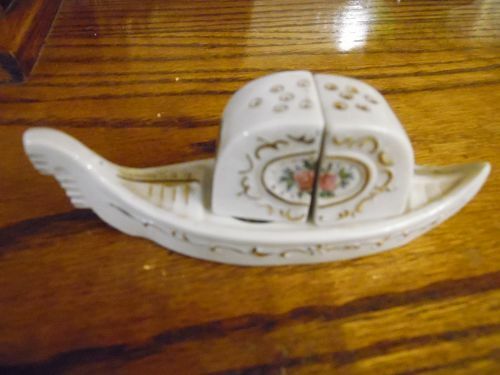 Measures4" long and are 1 1/2" tall. 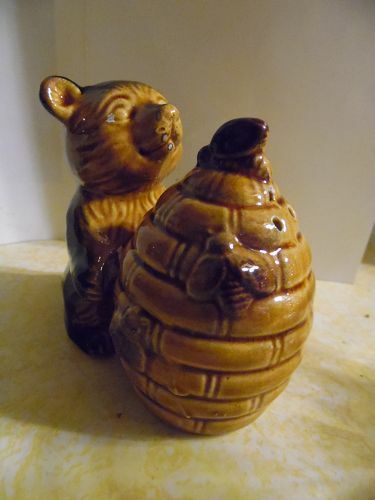 Very nice to add to your collection of vintage shakers, or as an addition to your beach or ocean themed kitchen. 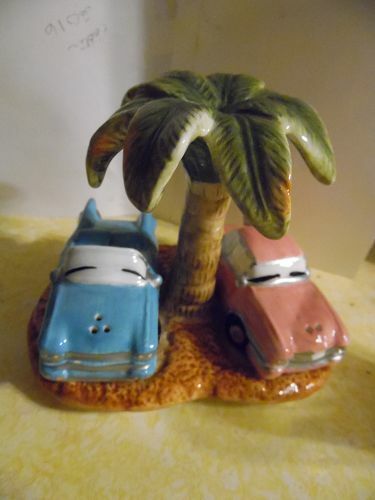 Adorable set of salt and pepper shakers parked at the beach under a palm tree. Fifties style cars looks like a cadillac and a pontiac. Made of hand painted ceramic.Original stoppers and every piece is in pristine condition. Tree is approx 5" tall and each car is about 4" long. This is such an adorable set to add to your collection or your summer house and fifties decor. 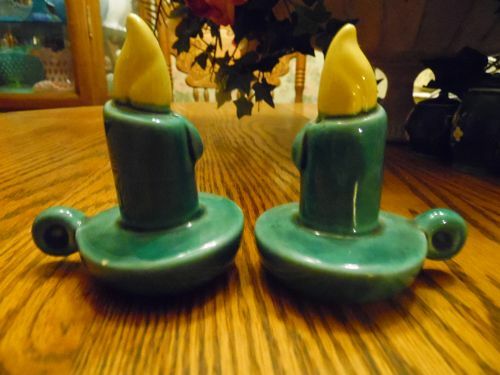 Adorable vintage candle holder salt and pepper shakers are made like the old fashioned chamber candle holders. They have the candle and flame too. Made of glazed ceramic. No stoppers or ID markings. Great condition. Measures 3 1/2" tall. 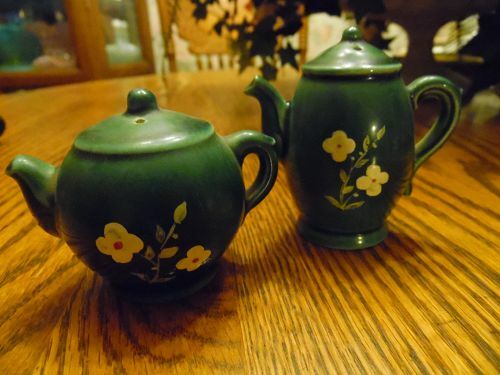 Vintage 1960s ceramic Germany Green Teapot Salt & Pepper Shakers Hand Painted P117b in mold with black ink Germany Stamp. Flowers decoration. This is in nice condition as shown with no chips or cracks, with original corks. 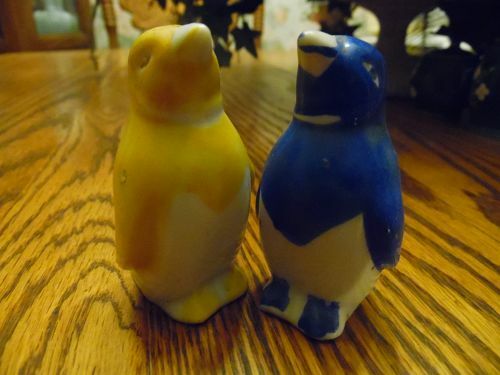 Vintage penguin salt and pepper shakers. One is yellow and one is blue. 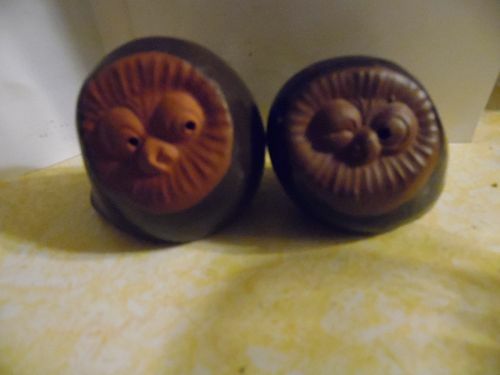 Measures 2 3/4" tall and have their original corks and a black JAPAN ink stamp. Crudely painted but no damages. 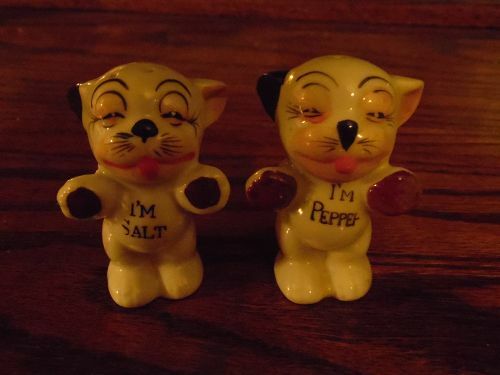 Adorable pair of hand painted Japan salt and pepper shakers. 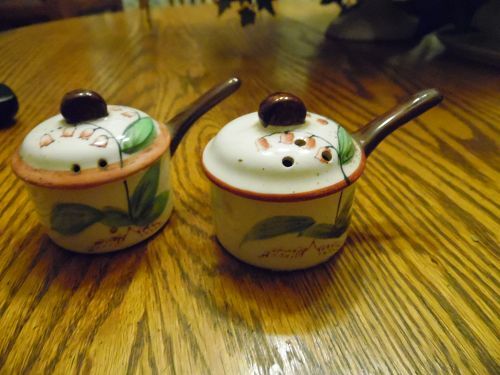 Each is a kitchen pot with lid and handle.Decorated with yellow flower plant. Perfect condition. Original corks. 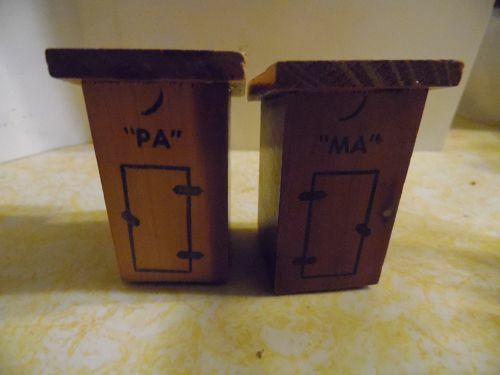 One has an old paper Japan sticker.Measures 2 1/4" tall and is 3 3/4" long including the handle. 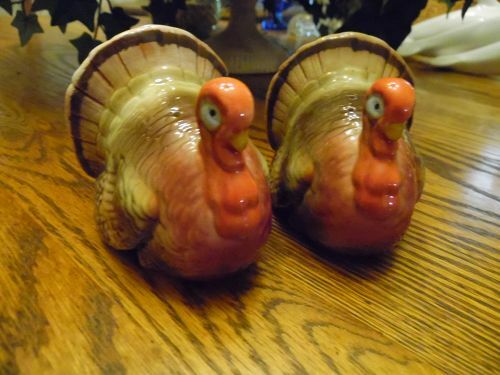 Pair of ceramic turkey salt and pepper shakers Made by Otagiri. Glazed finish and measures 2 7/8" tall. Original stoppers and no damages. Perfect condition and nice coloring. Original stickers. A great addition to your Thanksgiving table. Vintage souvenir ceramic salt and pepper shakers from Seaworld. 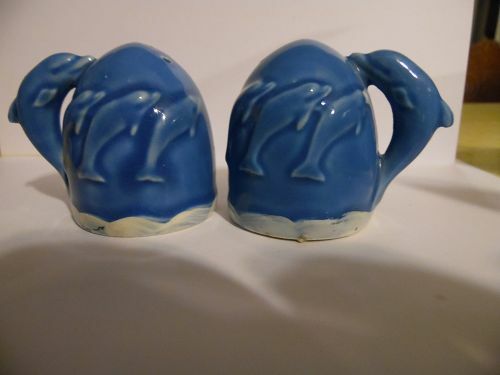 Blue glaze and are covered with leaping dolphins. The handles are even a dolphin. Measures 2 1/4" tall. Original stoppers, seaworld stickers and price tags. Perfect condition, as new. 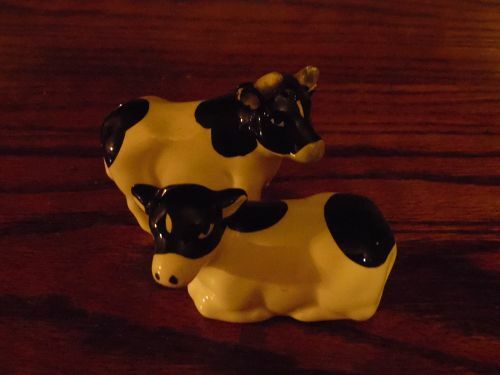 Otagiri Hand Crafted Salt and Pepper set: Cow and Bull salt and pepper shaker set are in beautiful condition. They have a nice shiny glaze still, still have the stoppers and the stickers.No stoppers. Foil sticker on bull.The bull is 2.5 inches tall and the cow is about 2.25 inches tall. 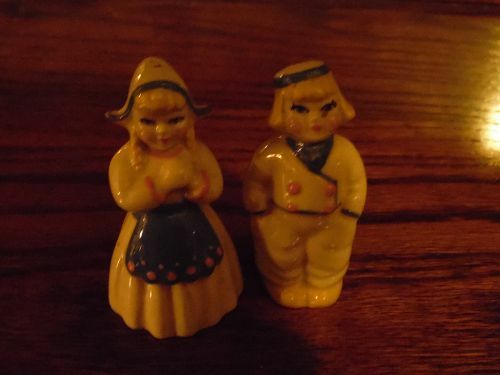 Ceramics Arts Studio Dutch boy and girl shakers 3"
Vintage 1950's Pair of Ceramic Arts Studio, Girl & Boy Dutch Couple, Pottery Salt and Pepper Shakers, Standing just over 3" Tall. This pair is in nice condition with the exception of a very tiny chip on the tip of her bonnet. Gorgeous set made in Madison, WI. Original corks are gone. 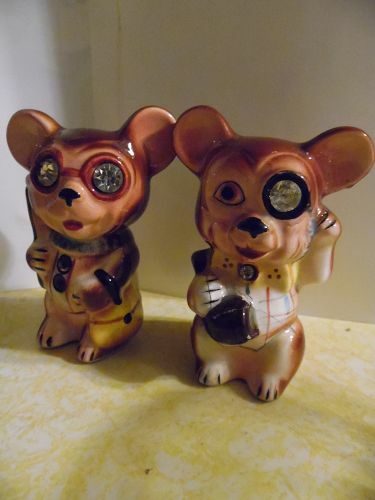 Bonzo was a popular character from the 1920's thru 1950's,and these vintage salt and pepper shakers capture his cute style. 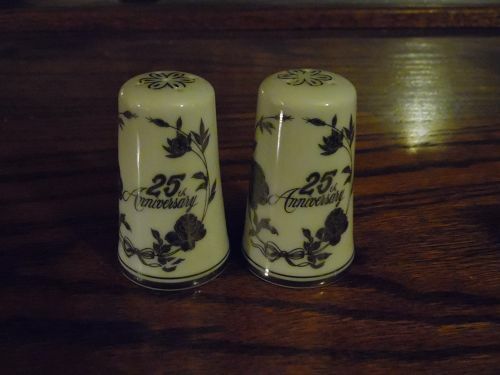 The shakers each measure 3" tall and are in very nice condition. Black Japan stamp,no corks.